LOW COST great value double door bottle cooler ideal for any pub or restaurant back bar. The unit has self-closing hinged doors LED lighting and capacity for 190 330ml bottles. Other great features include automatic defrost, electronic control and beautiful stainless steel finish. Cooked vegetables and fruit are pureed and mashed in minutes by the process of extrusion - forcing..
Infrico MCAF1000CI: Infrico back bar coffee machine unit & shelving, with adjustable legs .. 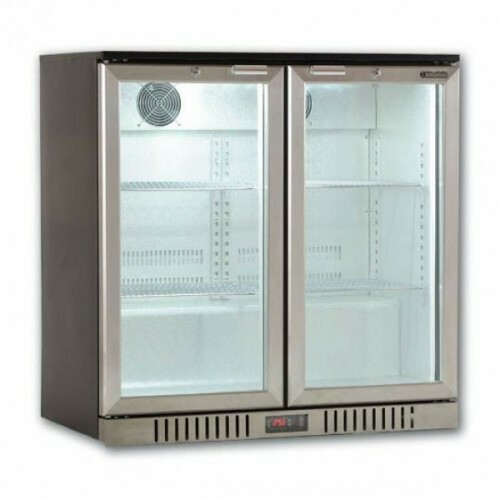 This superb value 1200ltr catering chiller comes with, 3 adjustable shelves per door, full commerc..
Polar 2 door compact counter refrigerator, gastronorm compatible with stainless steel interior and..
A chilled display unit ideal for the attractive presentation of cakes, pastries and desserts. Adju..